People’s United Bank is an independent bank headquartered in New England. They have online banking and a mobile app that provides access to a customer’s financial accounts. The mobile app allows users to pay other people, make deposits, and pay bills. I chose to improve the user experience of these two products as a case study for my portfolio. My role was to research and design a new and improved banking experience. I created a report that provide research on current banking trends and the background of the company. The report also laid out high level design goals. 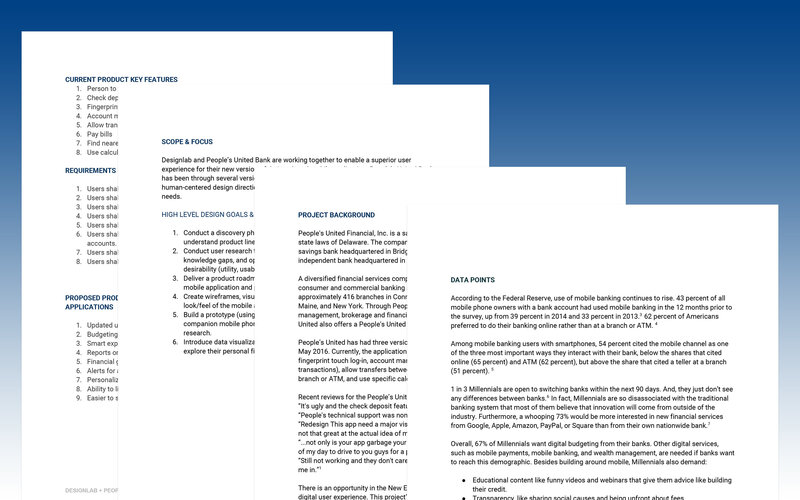 At the start of the project, I drafted business requirements to determine a scope and focus of the project. 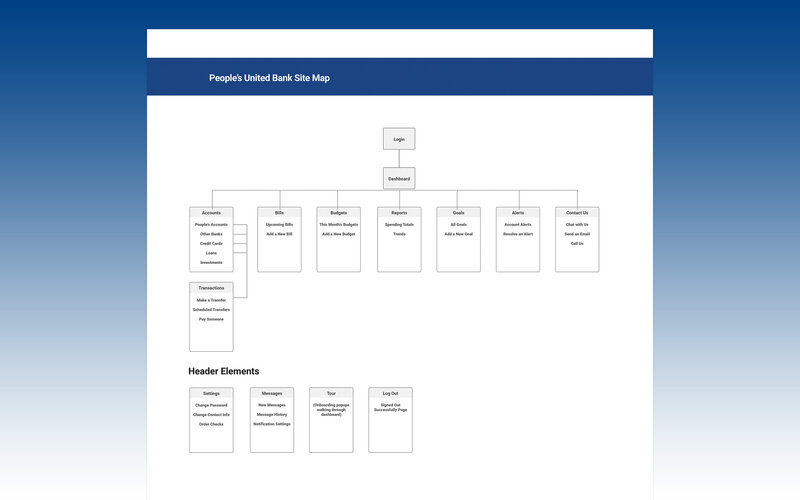 By analyzing People’s United Bank’s current needs, I found potential features that could improve the bank’s online and mobile user experience. My goal was for People’s United Bank to take advantage of the gap in the local market and provide the best local banking experience in New England. Another goal was to provide tools that allowed users to manage their personal finances better and ultimately improve their quality of life. 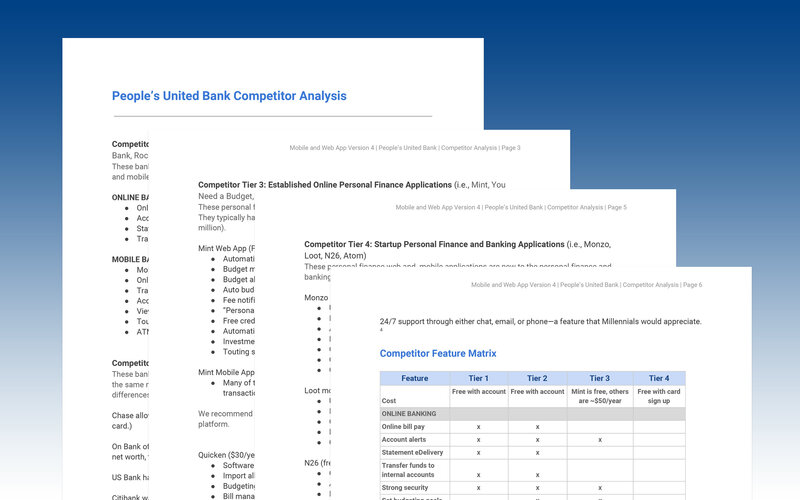 I separated competitors into four tiers to help analyze the different features offered. I then created a feature matrix to easily see what features were offered in which tiers. After determining product requirements, I researched competitors to identify features and services that are currently in the market. I looked at different tiers of banking companies—from local competitors to startups—to not only see how the product could be improved, but also to see the new innovative offerings of the industry. Research finding included survey and interview results. 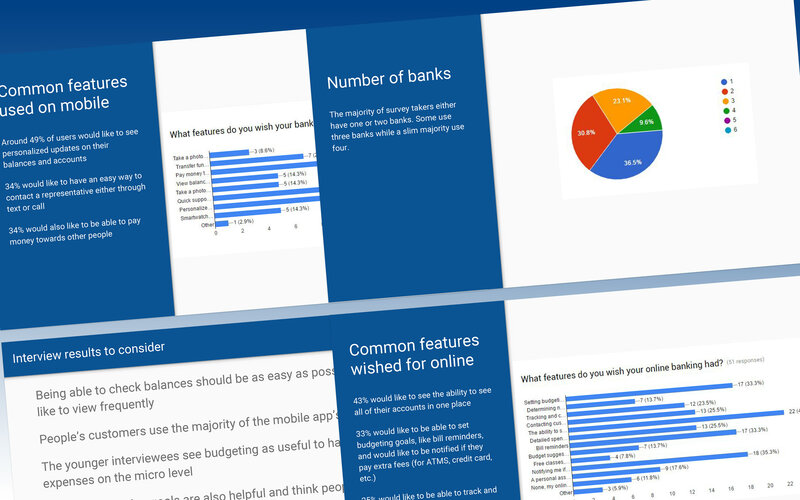 To better understand potential users, I created a survey to gather information on how people use their online and mobile banking services. Using Amazon Mechanical Turk, I was able to rapidly gather over fifty results that allowed me to delve deep into the relationship between the user and their bank. I also interviewed People's United Bank customers to see how they currently used the apps and what they would like to the service to provide. 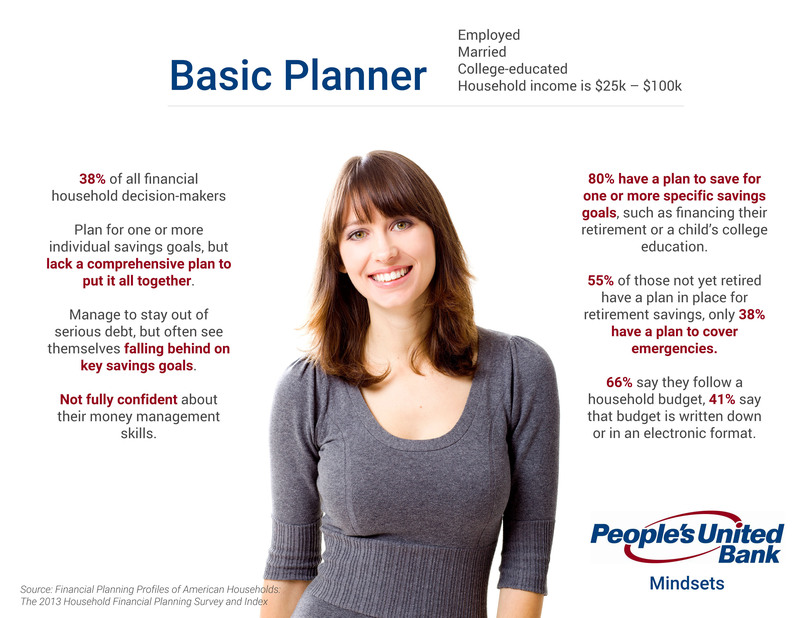 Personas were based off financial mindsets researched in 2013. This gave me an excellent understanding on the types of users that use People's United Bank's services. As I started to understand the features of the banking industry, I created a persona to better explore the behavioral patterns of the potential user. Working with my mentor, we applied the four personal finance mindsets researched by the Certified Financial Planner Board of Standards as the identity of the personas. The sitemap was necessary to organize the new features under the app's navigation. After analyzing the research, I designed a sitemap and appmap to create the foundational structure of the products. I started with the current foundation of People’s United Bank products and built on the features I found most applicable based on my research. Mid-fidelity mockups were done in Adobe XD to rapidly iterate to high-fidelity key screens. To begin setting up the visual aspect of the product, I created mid-fidelity wireframes using Adobe Experience Design (Adobe XD) to bring structure to my ideas. 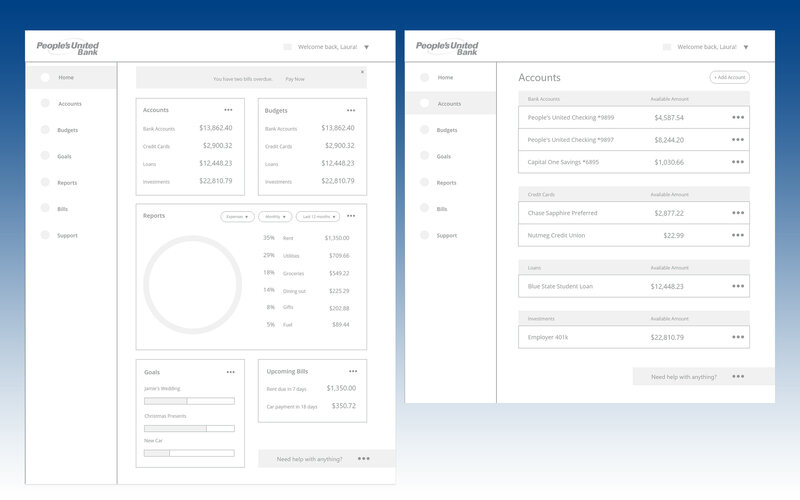 Creating wireframes in AXD allowed me to quickly transition into high-fidelity mockups for the final stage. I designed high-fidelity mockups using standard patterns for a dashboard web app. 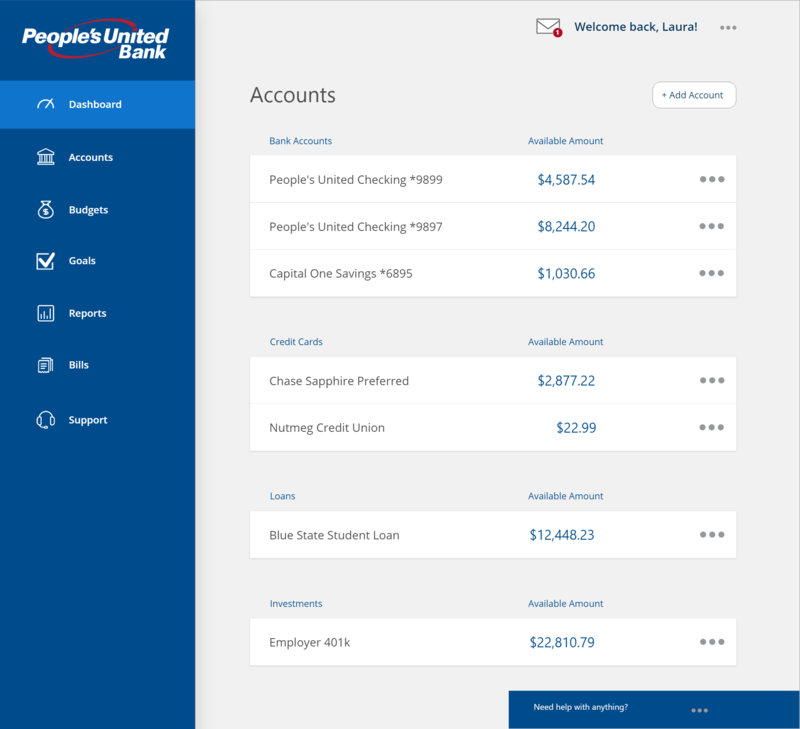 Using People’s United Bank’s brand identity, I updated the user interface for easier navigation and seamlessly introduced the new features inspired by my research. 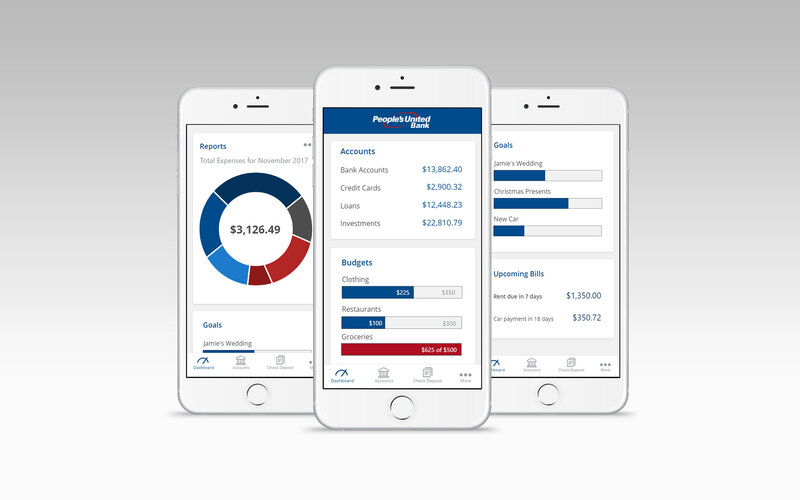 New features included tools to determine a budget, reports on spending, and ways to set financial goals. 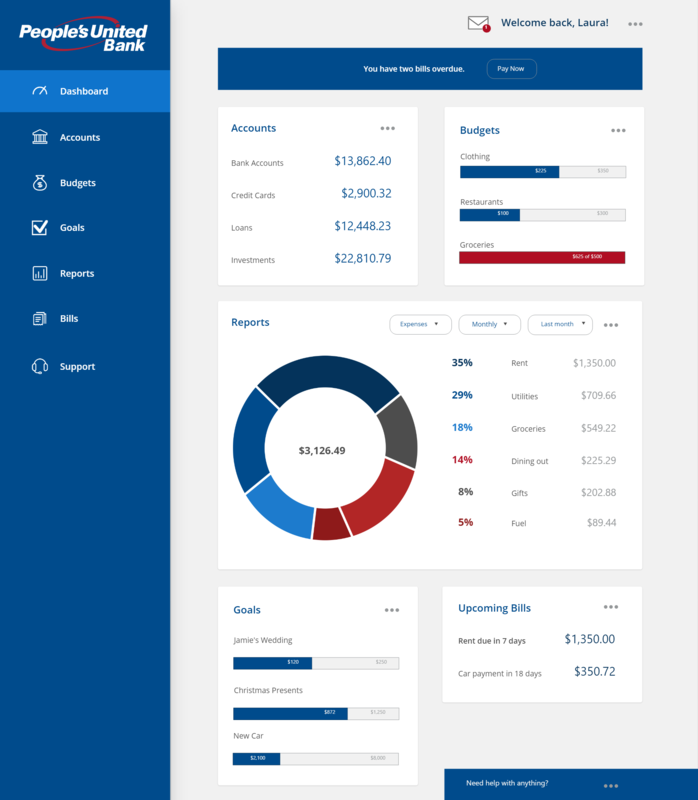 As someone who is passionate about personal finance and using tools that help me improve my life, I thoroughly enjoyed working on this project. 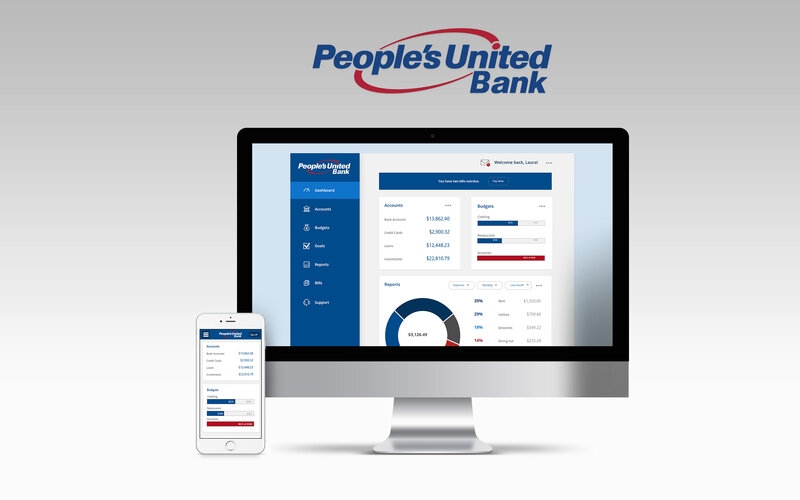 As a People's United Bank customer, I wanted to combine the excellent customer experience I have received at on-site locations with their online and mobile identity.